Is your urinary catheter clogged some percentage of the time? That could mean several things, and some of them are very dangerous. Here is something that might well help you. Below is an amazing article from one of our readers – Barry Simpson – who graciously allowed us to post it here. He was having hellacious problems with his catheter getting clogged. He was able to solve his problem, going from having basically 1 blockage per week for 7 months, to having none for the past 9 months! Before we get to his story, I need to post this disclaimer. DISCLAIMER: This information is from the story of Barry Simpson. It absolutely worked for him. And it might very well work for you. But this kind of data is not “clinical” or “scientific” in that the sample size was very small – just one guy, Barry Simpson. Your mileage may vary. OK, so now that’s out of the way, what follows is Barry’s story in Barry’s words. I had 23 catheter blockages between January and July 2016. Then I found a way of stopping them. I have had none since. This has left me with the impression that blockages have been too readily accepted as a normal part of having a catheter by the medical and nursing professions and are meekly accepted by trusting patients. Catheter blockages are an additional misery for people who, in many cases, have other serious conditions; they are more dangerous than is widely recognized and waste a great deal of nursing time unblocking catheters which do not need to be blocked. Here is the method which stopped my blockages immediately, completely and without any noticeable side-effects. I do not know for how many others it would be suitable. An accident in January 2013 left me with a spinal injury, almost complete paralysis below my shoulders and very little hand movement. I had a suprapubic catheter installed in May 2013. From 16th January until 24th July 2016 I had 23 catheter blockages. All of these were at night. I would waken up sweating profusely and trembling with violent spasms, typically between about midnight and 1am – long enough for urine to build up if my catheter had actually become blocked immediately after going to bed. At least two-thirds, but not all of my blockages were accompanied by sediment in my catheter. The last two blockages both occurred on the night of 23/24th July. My catheter was replaced after the first of these. The second blockage was described by the nurse as ‘positional’. Attending an earlier blockage, a different nurse had suggested that a possible cause was the catheter intake pressing against my bladder wall. So there seemed to be at least two causes of the blockages: by sediment and by the position of the catheter. What about the blockages not caused by sediment – the ‘positional’ blockages? To prevent these I simply gently pull my catheter forward each night immediately after going to bed to pull it away from my bladder wall. At the same time I also unstrap the catheter and leg bag from my leg and lay it flat on the bed to help gravity by ensuring that as much of my catheter as possible is at a lower level than the intake. The Users’ Information Leaflet says that the normal dose of Nitrofurantoin for preventing infections is 50mg or 100mg daily at night but does not say for how long. On the principle that it is best not to take more medication than necessary, after 30 days taking 50mg, I began tentatively to omit it on a few nights and risk the horror of a blockage. For about 3 months I took 50mg on 3-4 nights per week and then reduced it further to only nights when I had a considerable amount of sediment in my catheter or sweating which could warn of a urinary infection. The district nurses started giving me weekly bladder wash-outs soon after my blockages started: so the first few nights I omitted Nitrofurantoin were wash-out days. 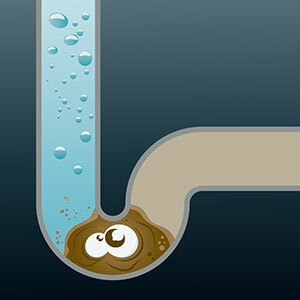 Wash-outs probably reduced the number of blockages but did not eliminate them. Not long after I reduced Nitrofurantoin to less than every night, I did begin to get sediment in my catheter. This seems to have been kept in amounts insufficient to cause a blockage by carers rolling the catheter between their hands to disturb it and by consuming natural antibiotics, including adding vinegar to food and drinking lemon tea. I had 23 blockages in a period of 190 days from 16th January to 24th July 2016, no blockage since (250 days up to the end of March 2017). The probability of Nitrofurantoin and catheter repositioning having had no effect can be calculated as the probability of 23 random occurrences in a period of 190+250 days all being in the first 190 days. The probability of two of them being in the first 190 days is 0.4318 x 0.4318 and so on until ….. The probability of all 23 being in the first 190 days is 0.4318 multiplied by itself 22 times = 4.0879e-9 = 0.0000000040879 which is a little over 4 chances in a thousand million (a thousand million is the number that 0.0000000040879 would have to be multiplied by to get 4.0879). The base is 0.4318 and the exponent is 23. So the probability that Nitrofurantoin and catheter positioning were not associated with stopping blockages is 0.0000000040879; therefore the probability that they have been associated with stopping blockages is 1 – 0.0000000040879 = 0.9999999959121 where absolute certainty equals 1.
where the number of outcomes is 2 (blockage on a day in first 190 days /blockage a day in following 250 days), the number of occurrences 23 and 0, p = 0.4318 and 1-0.4318 = 0.5682. These calculations are based on cautious assumptions. The probability of there being no association between taking Nitrofurantoin and the absence of blockages is likely to be even smaller than the very small probability of 4.0879e-9. On about 10 of the 190-day period with blockages I took Nitrofurantoin to cure urinary infections. I had no blockage on these days. So there is a case for reducing the period to 180 days, or fewer if the effect of Nitrofurantoin lasted for more than one day, and adding 10 or more days to the blockage-free period. If the period were reduced to 180 days The probability of all 23 blockages being in the first 180 days would become (180/(180+260))23 = 0.409123 = 1.1805e-9. There is no practical difference between using a period of 190 days, 180 days or fewer. 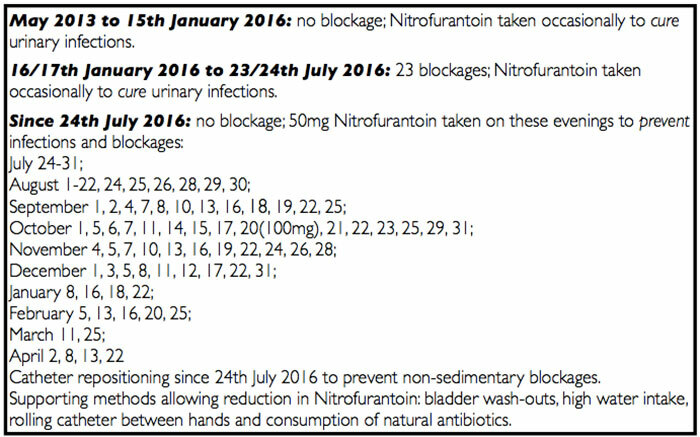 In all cases the probability of all 23 blockages being in this period by chance is so small as to be negligible; and the probability of Nitrofurantoin having had no effect is becoming even smaller every day I do not have a blockage. This very small probability means that it is virtually certain that Nitrofurantoin and catheter repositioning were associated with stopping my blockages; it is not the probability of having a blockage tonight; nor is it a prediction of when a blockage can be expected. The negative binomial distribution, the geometric distribution and the Poisson probability distribution rely on the events (blockages in this case) being independent – not connected to each other, even indirectly by a common cause – and randomly distributed. This is liable to introduce inaccuracies into the predictions if the connections are not taken into account. On the other hand, if predictions from these techniques do not fit observations, that will be evidence that there are connections between the events (blockages) and that there is likely to be a common cause. It might seem inconsistent that the effectiveness of Nitrofurantoin and catheter repositioning was demonstrated by the lack of randomness in the distribution of the 23 blockages between the 190 days without the treatment and the 250 days with it, while the techniques for predicting future blockages rely on them being randomly distributed. Not necessarily so; the predictive techniques would be used only in the period when the treatment is taking place. I do not have a good answer to this. I had my catheter for 2 years and 8 months before I had a blockage. On the evening of 16th January 2016 I was overheating so I took 500mg Paracetamol. That was the first time I had taken any since my catheter was installed. A few hours later I had my first blockage. The coincidence looked too close to believe that the Paracetamol had not played a part. I took no more Paracetamol but continued to have blockages about a week or ten days apart. Nevertheless, I have taken no more Paracetamol (Tylenol). Even without an analysis of the contents of my catheter at the time of a blockage, it is possible, by using a filtering process and information from the Internet, to identify the most likely bacterial culprits for my blockages. This might be important in identifying what other antibiotics are likely to be effective in preventing blockages for those who have an adverse reaction to Nitrofurantoin. 1. Against what bacteria is Nitrofurantoin effective? Citrobacter species, Coagulase negative staphylococci, E. coli, Enterococcus faecalis, Klebsiella species, Staphylococcus aureus, Staphylococcus saprophyticus, Streptococcus agalactiae. 2. It has been established that most of my blockages were associated with urinary infections, so which of these bacteria cause urinary infections? ‘Escherichia coli or E. coli, is responsible for more than 85 percent of all UTIs, according to a 2012 report in the journal Emerging Infectious Diseases. 3. Which of these bacteria cause sediment which could block a catheter? That leaves Staphylococcus saprophyticus and E. coli as the prime suspects. Although Staphylococcus saprophyticus is the better fit to the information I have been able to find, E. coli is a much more common cause of urinary infections. Without any analyses of the contents of my catheter at the times of infections with or without blockages, it is not possible to be sure. I can only guess how many of my blockages could have been avoided if taking a sample of the contents of catheters were standard practice when a blockage occurs. There might have been other mechanisms starting the blockages: an increase in urine pH, a change in brand of catheter …..
What I have reported is, of course, my own story. I do not know for how many other people it might be effective but there seems to be a reasonable expectation that it might work for others – male or female – whose catheters are being blocked by sediment created by bacteria for which Nitrofurantoin is effective. Nitrofurantoin will not be suitable for everyone. The Users’ Information Leaflet lists many precautions and possible side effects. I have not had any at the doses explained but others might. Nitrofurantoin was used to stop the bacterial blockages simply because it was the only antibiotic I had. Living alone, being almost completely paralyzed from the chest down and with very little movement in my hands, wakening up in the early hours of the morning, sweating profusely and with tremendous shocks of spasms, the task of ‘phoning for a nurse is quite a demanding and troubled one. Then there is the wait of between about 40 minutes and 2 hours 15 minutes with the sweating and spasms progressively becoming more severe. The same paper quotes that ‘In the UK, permanent catheters are used by 3% of people living in the community and 13% of care home residents’. Blocked catheters are at least traumatic, at worst they are killers, they are expensive in terms of nursing and other medical staff time and resources and occur on a scale which makes them one of the most common healthcare problems. Some of the papers quoted in this section make the often-heard call for better catheters, which would empty the bladder completely and so reduce infections and blockages. 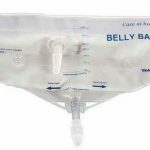 Sadly, it is no surprise to read this, but until they are available, there remains a need for preventing blockages in the catheters which we have. 1. Any of you guys had their catheter taken out 4 weeks post op? I am concern that it will be too long, and risk of infection will be higher. 2. Any of you had a roscatto like colored urine in their bag?-this happened 10 days post op. We had company in the house and I walked a lot than usual and stood longer that day. I just don’t know if that was the reason, I also saw some tissue like substance and blood spots in my urine bag. Have anyone of you experienced something like this? I had my catheter in for 6 months. I only had one UTI and it was after the first 2 weeks. I never had another one in the subsequent 5 months. Once you are “cathed” and it is left in, yes, you are at increased risk for infection. But it doesn’t follow that having it in for an extra week or two increases your risk by a huge amount. Once the catheter is taken out, your doctor should order a urine test to check for the presence of infection-causing bacteria in the days that follow. If they don’t do this, I recommend you ask for a urine test to be performed after a few days catheter-free. As for the blood in the urine – it does happen occasionally. For me it usually happened overnight. I’d wake up and there would be red in my bag. But after getting up and emptying the bag, the color returned to normal. This is typically due to the tip of the catheter coming into contact with the bladder wall and sucking a bit of the tissue into the inlet hole (which is always creating a sucking action). That irritates the bladder wall and can cause bleeding, which will show up in the bag. It isn’t abnormal. A little leakage around the catheter i.e. bypassing during a strained BM is not serious or unusual. I used to get this but haven’t with the last 3 catheters. Urine flow with a catheter does vary, especially when routine changed, e.g getting up and moving around. I found all silicone Foley catheters too painful, and am now pain free with hydrogel-coated latex Foley catheters. Hope this helps. Since January 2017: rolling catheter between hands and consumption of natural antibiotics: lemon tea (half a lemon), 30ml. vinegar on food; since April 2018, olives. Thanks for your comment and all that detail, Barry! NO blockages since 2016 is amazing. For folks who don’t know what Nitrofurantoin is, check this information out: https://www.rxlist.com/macrobid-drug.htm. It’s an antibacterial agent specific for urinary tract infections. Thanks again! Thank you for your kind comments Ken, and for running this web site. Barry. You’re welcome, Barry. The least I can do. Hi James. As with all situations where you don’t seem to be getting satisfactory information, I highly recommend getting 2nd and even 3rd opinions. Nurses have their areas of expertise. But in this case I think you should get a doctor’s opinion as well. Hope that helps.